The expanded export market, the export revenues hitting record high with US$40.02 billion, and the promotion of domestic consumption are the bright spots of Vietnam’s agricultural sector throughout 2018, which also witnessed the highest agricultural growth rate over the past seven years. Vietnam’s economy is forecast to grow by 6.8-6.9 percent in 2019 on the back of sound economic performance in 2018, according to the Vietnam Macro-Economic Outlook 2019, which was announced in Ho Chi Minh City on January 8. Under a new regulation, commercial banks will have to switch 30 per cent of their current magnetic strip ATM cards – more than 25 million in total – to chip cards by the end of this year to enhance safety and service quality. Power shortages could occur in the southern region from 2021 to 2025, according to a report from Viet Nam Electricity (EVN). Phu Khanh Solar Power JSC and competent agencies of the central province of Phu Yen held a ceremony in Xuan Tho 1 commune, Song Cau district on January 8 to begin the construction of Xuan Tho 1 and Xuan Tho 2 solar power plants. A cooperation agreement to promote a train tourism programme was signed between the SaiGon Passenger Transport JSC and the Da Nang Tourism Association of the central city of Da Nang on January 7. The Ministry of Public Security is investigating 210 loan shark gangs who are lending money to around 2,000 people and demanding payback at extortionate rates. Dong Nai should pay more attention to urbanization besides industrialization, Deputy Prime Minister Vuong Dinh Hue told the southern province’s officials during a working session on January 8. Ho Chi Minh City’s agricultural sector will concentrate on shifting to crops and animals that can bring greater economic value and improve farmers’ incomes, heard a conference in the city on January 8. On Monday, the State Capital Investment Corporation (SCIC) reported after-tax profit of VNĐ8.25 trillion (US$358.7 million) in 2018, 52 per cent higher than the target for the year. Farmers in the Mekong Delta province of Soc Trang have got higher profits since they switched to organic rice cultivation. With almost one month to go before the start of the Lunar New Year (Tet) Festival, local people are rushing to Quang An flower market in Tay Ho District, Hanoi, to find the perfect decorative item for their home. 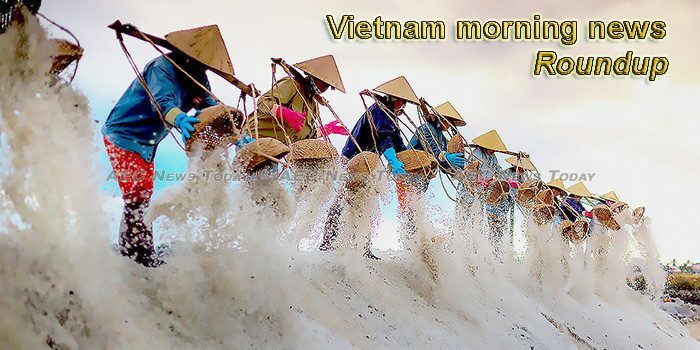 Salt producers in the Mekong Delta province of Ben Tre have yet to begin their harvest one month into the 2018 -19 season because of unseasonable rains. Up to 53.6 per cent of information technology (IT) companies said they hope to increase their workforce by 10-30 per cent this year. Four domestic carriers namely Vietnam Airlines, Vietjet, Jetstar Pacific and the Vietnam Air Services Company (VASCO), reported a total of 39,632 delayed flights in 2018, representing 13.4 percent of their flights – a year-on-year increase of one percentage point. Thai Ambassador to Vietnam Tanee Sangrat led a delegation of the Thai embassy on a working trip to the northern province of Thai Nguyen on January 8 to enquire about cooperation opportunities between the two sides. Shares of the construction conglomerate Cotec Construction Joint Stock Company (Coteccons), coded CTD, have recovered strongly since early November, climbing by 14 per cent after two foreign management funds announced they would increase their holdings in the company. Thanh Ha district of northern Hai Duong province is taking steps to conserve and utilise the genetic resource of an almost-200-year-old lychee tree believed to be the origin of the local lychee specialty. The National Power Transmission Corporation (EVNNPT), a subsidiary of the state-owned Vietnam Electricity (EVN) group, transmitted 184.5 billion kWh of electricity in 2018, up 11.03 percent from the previous year. The central province of Quảng Trị is going to build a seaport at a cost of VNĐ14 trillion (US$614 million) at local Mỹ Thủy Beach in an attempt to boost development of the province’s key economic zone. Issuance value of corporate bonds in Vietnam reached a five-year high of 39.45 trillion VND (1.7 billion USD) in 2018, data from Bao Viet Securities Co (BVSC) showed. Businesses have been increasingly satisfied when dealing with administrative procedures in export-import activities but stated that more reforms are needed, according to a survey by the Vietnam Chamber of Commerce and Industry (VCCI). National Assembly Chairwoman Nguyen Thi Kim Ngan on January 8 called on the procuracy sector to speed up its work on especially serious corruption and economic cases, and exert greater efforts to promote anti-corruption and the fight against crime. Prime Minister Nguyen Xuân Phúc asked accountability to be enhanced in the restructuring and divestment of State-owned enterprises (SOEs) to improve the efficiency of the process. Hanoi was covered by thick smog this morning, January 9, amid cold weather with light rain. A passenger bus with 23 people on board drove off the winding Hải Vân Pass in Thừa Thiên-Huế Province on Tuesday afternoon, plunging downhill and killing at least one passenger. One Vietnamese sailor has died and two others are still missing after the Vietnamese oil tanker Aulac Fortune caught fire off the coast of Hong Kong on January 8, reported the Ministry of Foreign Affairs. A start-up campaign targeting students and youths was launched in Ho Chi Minh City on January 8, as part of the “One Commune, One Product” programme. The Authority of Information Security,under Việt Nam’s Ministry of Information and Communications, has forecast five major trends in network safety and security to watch in 2019. The Việt Nam-Bulgaria Trade Promotion and Investment Centre opened in Hà Nội on Saturday, improving conditions for Vietnamese businesses to boost investment and exports to Bulgaria as well as accessing other EU markets.